Keeps skin allergies at bay, and locks the moisture into the coat to keep it lustrous. Orijen Six Fish has been specially crafted from a blend of a profusion of fishes, and a variety of high grade fruits and vegetables. 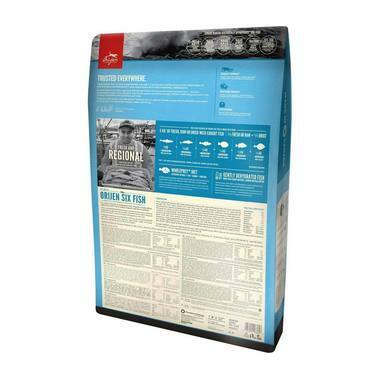 Fish is a source of easily digestible protein and Omega-3 fatty acids. Protein helps increase the muscle mass and makes sure that the organs and immune system function properly. EPA and DHA present in omega-3 fatty acids sustain the cardiovascular system, maintain neurological health, reduce dermatitis and other skin allergies, and keep the coat lustrous. The fruits and vegetables are rich in fibers to ensure your dog doesn't suffer from constipation or diarrhoea, assist with keeping her weight in check, and decreases the risks of colon cancer. 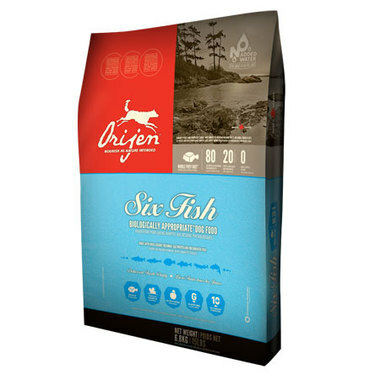 Orijen Six Fish is thus a savoury biologically appropriate food crafted just for your dog.